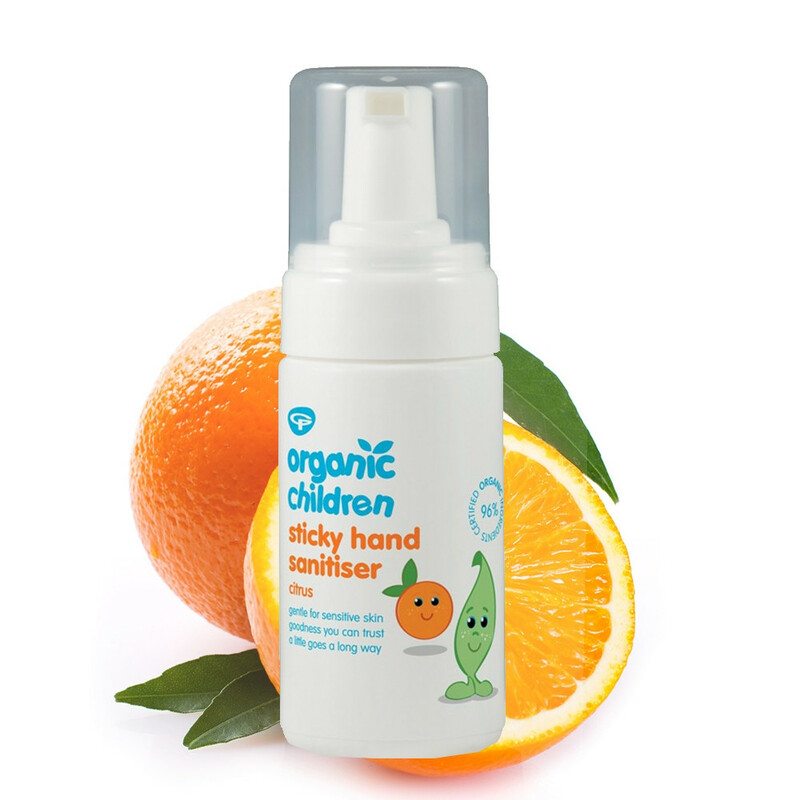 An organic, protective and non-sticky, hand sanitiser for on-the-go mums and dads. Children’s hands and faces seem to magnetically attract dirt, which can of course be of concern to mums and dads who just want to keep their children healthy and happy. Perfect for out and about, this is a natural antibacterial sanitiser which is safe for children and babies’ delicate skin. It removes dirt and germs easily – one squirt is all it takes – with no need for water or to rinse off, and parents can use it after nappy changes too. Its key ingredient is Tea Tree, well known for its strong antibacterial and antiseptic qualities, and is excellent for many types of skin problems. Freshly scented with Orange and Mandarin, this product also soothes using Aloe Vera. Contains up to 200 applications per bottle – one pump deposits just the right amount of foam, so no excess residue! Perfect handbag size too. Skin Type: Suitable for all skin types, including those prone to eczema and psoriasis. Application: Apply whenever required directly to sticky hands, or apply with a cloth to wipe sticky faces. Can also be used to clean toys and highchairs. This product is safe for babies too. Tip: Suitable for children with sensitive skin. Ingredients: AQUA (SPRING WATER), CAPRYLYL/CAPRYL GLUCOSIDE (PLANT DERIVED), LEVULINIC ACID (PLANT DERIVED), ALOE BARBADENSIS (ALOE VERA) LEAF JUICE POWDER*, CHAMOMILLA RECUTITA (CHAMOMILE) FLOWER EXTRACT*, GALACTOARABINAN (LARCH TREE EXTRACT), AROMA [CITRUS NOBILIS (MANDARIN) PEEL OIL*, CITRUS LIMON (LEMON) PEEL OIL*, CITRUS AURANTIUM DULCIS (SWEET ORANGE) PEEL OIL*, LAVANDULA ANGUSTIFOLIA (LAVENDER) HERB OIL*^, CEDRUS ALTANTICA (CEDAR) WOOD OIL*^], MELALEUCA ALTERNIFOLIA (TEA TREE) LEAF EXTRACT, POTASSIUM SORBATE, CITRIC ACID, CITRAL*, LIMONENE*, LINALOOL*. Ingredients that Green People don't use in their products: Organic Children Sticky Hand Sanitiser is a great alternative to mainstream hand sanitisers that use chemical ingredients such as alcohol (ethyl alcohol, ethanol), methylisothiazolinone, methylchloroisothiazolinone and Triclosan which can strip and dry out the skin.